More new content on the George Whalley website! 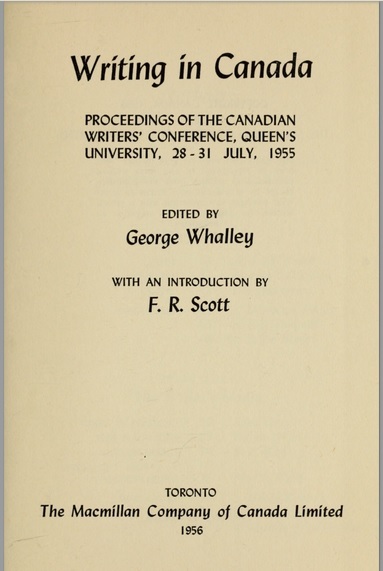 It’s with pleasure that we’ve now made available on the Whalley site a digital copy of Writing in Canada, George Whalley’s edited proceedings of the prestigious Canadian Writers’ Conference held at Queen’s University in July 1955. 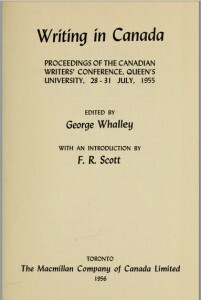 The 1955 conference was a veritable who’s who of writers in Canada, with delegates including Earle Birney, Desmond Pacey, Eli Mandel, Anne Wilkinson, Dorothy Livesay, Hugh Garner, James Reaney, Jay Macpherson, Phyllis Webb, Adele Wiseman, Ralph Gustafson, Douglas Spettigue, Miriam Waddington, Irving Layton, Frank Scott, Louis Dudek, A.J.M. Smith, and Morley Callaghan. 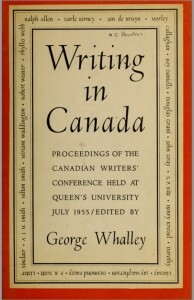 Writers and critics were brought together at the conference with publishers, journalists, and interested members of the public to investigate a number of common concerns with writing in Canada, from concrete problems like a lack of contemporary Canadian poetry in school texts and a need for cheap editions of Canadian works to broader questions about what people read in Canada, whether criticism is beneficial to writing, and the impending obsolescence of the book form. All of these questions have echoed throughout Canadian literary history; Editing Modernism itself is part of a movement towards remediating the issues of access to Canadian books identified in 1955. As Douglas Fetherling observed in the Kingston Whig-Standard in 1988, the conference took place at a decisive moment in Canadian cultural (and especially literary) history, with the Massey Report fresh off the press and the Canada Council just over the horizon. “To the delegates attending the Kingston conference,” writes Fetherling, “the future was of course unclear. But they appeared to sense that they were standing on a threshold. It must have seemed that anything was possible.” This sense of possibility permeates Writing in Canada, as does the intensity with which various means of fulfilling it were advocated—an intensity that led Whalley to describe conference discussion as a kind of “extreme literary criticism … in which the various branches of literature attacked each other unmercifully and accused each other of all kinds of crimes and fancies, some of them unmentionable” (Writing in Canada MS, QUA). 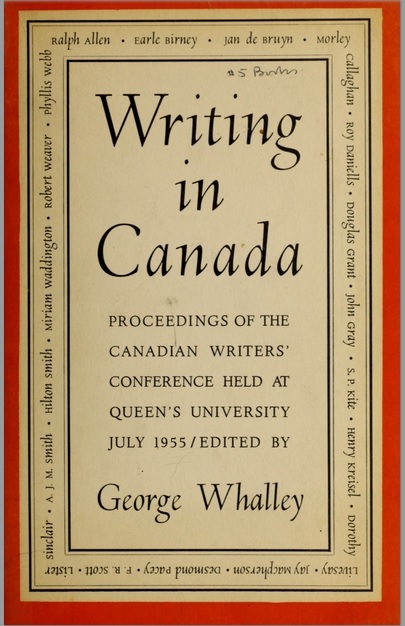 Writing in Canada’s reflection of this influential and highly-charged moment in Canadian literary history is must-read material for anyone interested in the direction of literary production and the cohesion of literary community in Canada. 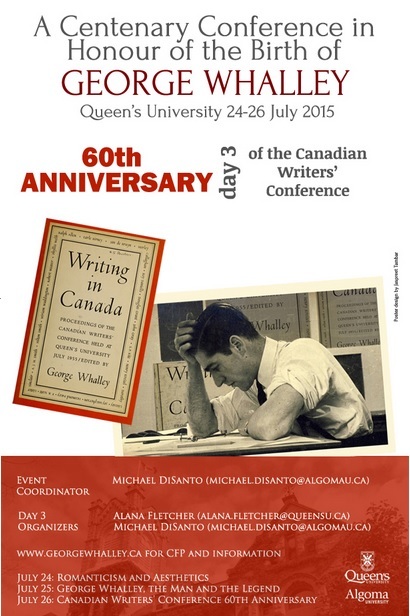 It is an especially apt historical touchstone to consult in the run-up to 60th anniversary of the Canadian Writers’ Conference taking place this coming July at Queen’s University. We hope this meeting, which is part of a larger three-day conference held in honour of George Whalley’s centenary, will revisit some of the issues of 1955 in a contemporary context with an intensity to rival that of ’55. 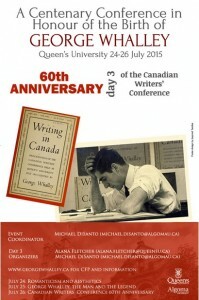 Find the full text of Writing in Canada here and the call for papers for the 60th anniversary of the Canadian Writers’ Conference here. And don’t forget to get your conference paper proposals in to us by October 31st!